You would think that the crushing display of force used by the Ahmadinejad regime to crush protests would have imposed a tense silence upon Iran. Despite a ban on foreign news coverage of protests in Iran, news has leaked out that tens of thousands of protesters poured into the streets of Tehran. There have been reports of clashes with smaller groups of pro government demonstrators. Associated Press reports as follows on the situation in Tehran. "Tens of thousands of students, many shouting "Death to the Dictator!" and burning pictures of Iran's supreme leader, took to the streets on more than a dozen campuses Monday in the biggest anti-government protests in months. Riot police and pro-government Basij militiamen on fleets of motorcycles flooded Tehran's main thoroughfares, beating men and women with clubs as crowds of demonstrators hurled bricks and stones. Some protesters set tires and garbage cans ablaze. "Death to the oppressor, whether it's the shah or the leader!" the students chanted, according to witnesses - making a daring comparison between Supreme Leader Ayatollah Ali Khamenei and the pro-U.S. shah, despised in Iran since his overthrow in the 1979 Islamic Revolution." The International Campaign For Human Rights in Iran has reported that protests have spread to several universities in Teheran as well as to other cities across the country. The Ahmadinejad regime continues to show its desperation to contain unrest in Iran by slowing down the Internet as well as cell telephone networks in an effort to stop protestors from mobilising on line and via text messages. Keeping information from getting out of the country has been a losing battle, despite the technological clamp down. In an attempt to show its strength in the streets, the Ahmadinejad regime kicked off Basij week with a rally last Friday. The Basij is the armed enforcers maintained by the Ahmadinejad regime. 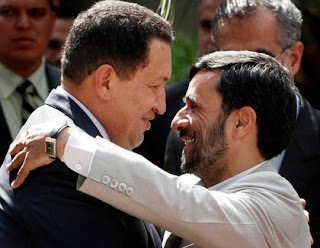 According to Michael Ledeen of the International Analysts Network, the Ahmadinejad regime has attempted to intimidate the opposition, with occasional flashes of laughable clumsiness detailed by Ledeen as follows. "This Friday, 7 million Basijis are supposed to march to celebrate Basij Week, and cell phones all over the country have received a text message reading: “You have been identified as a participant in post-election gatherings and must refrain from such participation from now on.” The intimidation campaign has not been conducted with great efficiency; Ahmadinejad got the same message, as did a baker in Khuzestan, deep in the south." Iran's nuclear ambitions as well as its networking with Venezuela, North Korea and other enemies of the US almost seem to be an exercise in escape from its domestic difficulties. It is very easy to stage a photo op with Hugo Chavez, or to share intelligence information with North Korea, as Iran has recently done. It is far more difficult to keep the peace in Iran, which not only is a youthful country but ethnically diverse as well. The Iranian Minorities Human Rights Organisation maintains a focus on the Arabs, Azeris, Baluchis, Kurds as well as the Bahais, Jews and Zoroastrians who along with other ethnic and religious minorities have their own lists of grievances against the central government. There is a long list of Muslim countries, most notably Saudi Arabia with its large Shiite minority that resent the hundreds of millions of dollars that Iran spends fomenting unrest in neighbouring countries. There are plenty of Iranian citizens living in underdeveloped and impoverished regions of Iran who also take heated issue with the spending priorities of the Ahmadinejad regime. Even if the student protests reported on today die down, Iran has a long list of domestic problems and enemies it has cultivated in neighbouring Arab countries. Even if Iran gets the bomb, it is quite likely that it will not be Ahmadinejad who controls it. Iran's student protestors have risked more than we in the West can imagine. They will not be going away any time soon. And they may be joined by workers and members of Iran's minorities. Ahmadinejad should expect his situation to get a lot more interesting. Even if he gets the bomb, he can't drop it on Tehran.